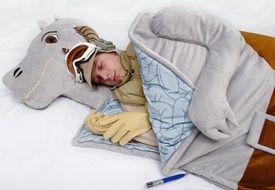 The makers of the Tauntaun sleeping bag apparently has something very special planned for April Fools'. If you're at all interested in funny geek clothing and accessories, you've probably seen the Tauntaun Sleeping Bag (pictured), but you might not have known that it actually started as an April Fools' joke. The Sleeping Bag met with such high customer demand that Think Geek managed to work out a deal with LucasFilm and put it into production in time for Christmas last year. Well, April Fools' is almost upon us again, and Think Geek is promising that it has other wonderful, and imaginary, items up its sleeve. I asked them for some tidbits of information, but with traffic increasing on the site nearly six fold on April 1st, Think Geek is understandably tight-lipped about what it has in store. A quick look at its April Fools' Gallery however, suggests that whatever it is, we're in for a treat. My money is on dancing storm trooper puppets, something to do with ninja-style tap shoes and a device that makes asparagus taste like bacon; and who knows, if people make enough noise, maybe we'll see another fictional product become real.